ORLANDO – Robert Palmer has already seen first-hand how a community can blossom when charitable and compassionate organizations team up. After his widely successful company, RP Funding, became the inaugural Founding Partner of the Lakeland Magic earlier this year, Palmer quickly noticed incredible growth within Polk County. So inspired and encouraged by the positive vibes and transformations, the well-established entrepreneur figured it would make sense to expand on these philanthropic efforts. Prior to Friday’s game between the Orlando Magic and San Antonio Spurs, RP Funding was named the latest Champions of the Community (COTC) partner of the Magic and Amway Center. Palmer’s company will join the other COTC partners, Walt Disney World, Florida Hospital, PepsiCo., Harris and FanDuel, in making a direct impact on the lives of those that call Orlando home. “Lakeland was really the tip of the spear and the opportunity there to help do that for my hometown and help support the building I graduated high school in. But this is the big brand. This is the big part of their operation so it just made sense for us to extend the partnership over here. I’m proud to be the official mortgage lender of the Magic,” he added. What was also special for Palmer was that 250 of his RP Funding employees celebrated this announcement with him. They attended Friday’s game and all wore RP Funding shirts. Last season, RP Funding hosted a sleepover for local, underserved youth at Amway Center featuring suite tickets to a Magic game, meeting Magic players, shooting on the court, a movie on the videoboard and video games. Beds were donated to the kids along with gift bags for each child. RP Funding will look to build on the success of last year’s philanthropic partnership with a future fundraising opportunity in conjunction with the Orlando Magic Youth Foundation (OMYF), the Magic’s charitable arm. RP Funding will enhance their presence at Amway Center with branding underneath the center-hung videoboard and pole pads. There will be other RP Funding signage around the court as well. Palmer’s commitment to the community has led him to undertake additional sports ventures. He recently purchased the Jacksonville Armada of the North American Soccer League. Aware of the impact professional sports teams have and how they help connect people from all walks of life, Palmer is excited thinking about how being a sponsor of one team and an owner of another can benefit the community as a whole. 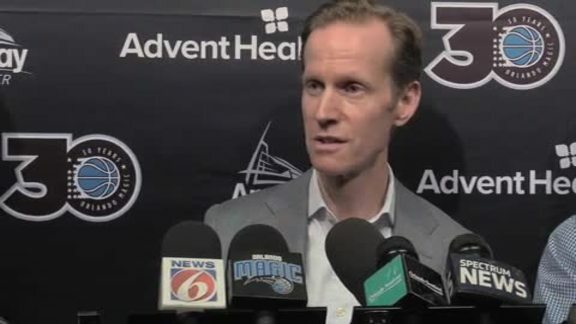 The Magic are proud to have a partner that shares the same goals and vision that they do. Delivering legendary moments both on and off the court is a priority for Palmer, who always admired the Magic from afar while growing up in Polk County and as a season ticket holder for the last six years. Both Martins and Palmer are also very excited about the Lakeland Magic, who tip off their season on Nov. 4 and play their home opener at the RP Funding Center on Nov. 10.